Posted in French, Greek, Italian, Middle Eastern, North African, recipe, savory, Spanish, Turkish by Antonio Tahhan on December 29th, 2009. You can follow any responses to this entry through the RSS 2.0 feed. You can leave a response, or trackback from your own site. Great post Tony! I especially love the video! My dad also makes homemade yogurt using a similar method. He tells me that I should write a post on it. If he badgers me enough, I just might. I’m definitely giving this a try. There will be more Naan baked at my house for sure! Great post! I always remember my teta’s blue blanket that she used to cover the yoghurt with! Your explanations make it look easy, which it is, but not many people know that! I’ve been hesitating to try to make my own yogurt, but this is definitely encouraging! Thank you for sharing this great video. She reminds me of my grand mother. 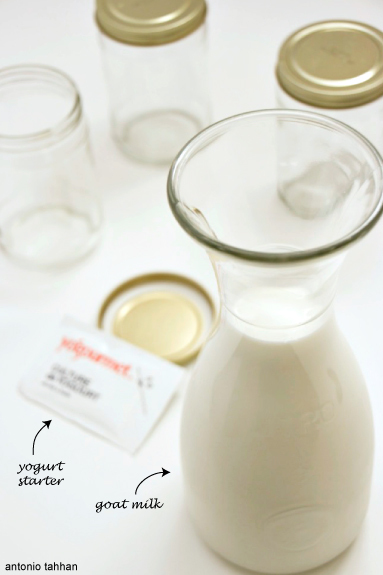 I totally agree that making yogurt is so so so simple! Except that we do it differently. The ‘starter’ that we use is just yogurt that we have made the previous time. So as each batch goes, the yogurt just gets better and better. Of course, for the first time, we need to use a good quality store-bought yogurt, preferably one that is unsweetened. The next time, I will try having them in the oven overnight. By the way, what is the lowest setting of your oven as mine is a dial and the lowest is about 50C. I hope you do give it a try Kirstin. It’s worth it; especially if you love goat or sheep milk yogurt. Great video clip Tony! My mom also showed me how to make yogurt and it’s amazing how the similar the approach is with your aunt. We use plastic tubs. Go to a deli and ask if you can buy some or they may even just give you some if you’re a regular customer. You know I have been meaning to dabble in making yogurt at home and and have yet to try. You’ve made it seem so simple a task that I have no excuse now! This looks thick and luscious, so different from our North American yogurt. I thoight it just couldn’t be duplicated…until now. Tony, this is the most straightforward and well-illustrated account of homemade yogurt I have seen yet! I love the idea of reusing jars. I will be (finally) trying this very soon. Where do you get your goat milk? I don’t get to Whole Foods often, but I think they might have it there? 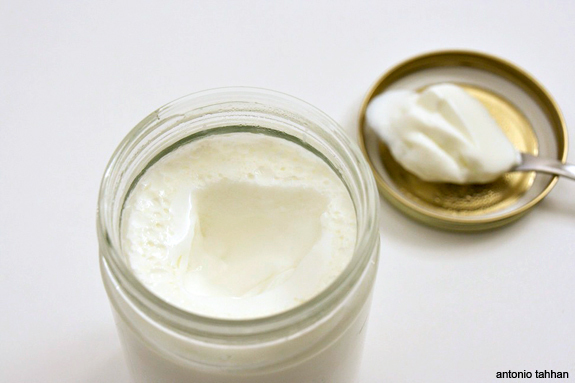 i was musing just yesterday about how i would make soy yogurt myself without a ‘maker’. thank you for being the only man to read a woman’s mind weeks before i even thought it. I can’t wait to try this. You have taken my fear out of making yogurt. Fantastic post! 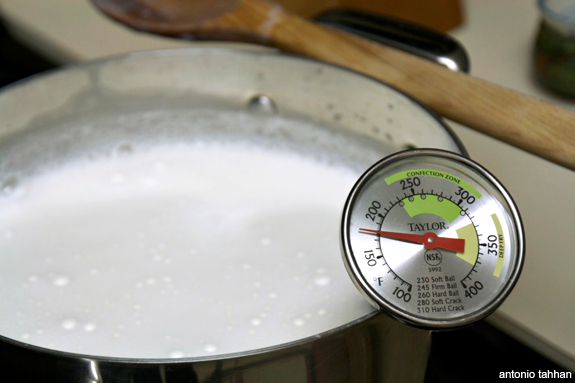 I love yogurt but always thought you needed fancy equipment or special ingredients to make it. Now you’ve made it look gloriously simple! And the yogurt looks so creamy! My grandma makes it in a different way, she uses the live cultures and pieces of cloth and medri shu… but in the end all she needs are a few jars and pieces of cloth! Beautiful post and i love the video…the lady is so cute and knows her stuff!! Thanks for this post. You’ve made it so simple and easy to make. I better have those jars first. Delish! much better than store bought. 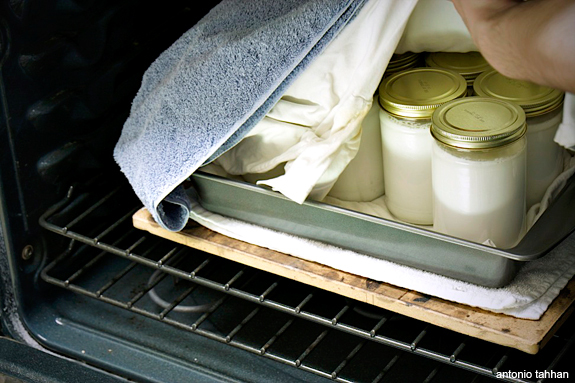 I make my yogurt in my big crock pot turned on the lowest setting & covered w a big towel. I like greek yogurt best. @Helen — I will do my best to post a recipe soon. Thank you for stopping by!